Hossein Irandoust-Moghadam was born in 1978 in Tehran, on the eve of the Iranian revolution. He was born to an Iranian mother and a half Chinese, half Iranian father. His grandfather, a Chinese engineer, came to Iran during the reign of Reza Shah Pahlavi and was responsible for establishing a tea factory in the Caspian town of Lahijan and adopted Iran as his native country. Hossein started painting at a young age and later on was trained by the renowned realist painter, Rahim Navasi. He graduated from Azad University with a Bachelor’s degree in Fine Arts in 2003. 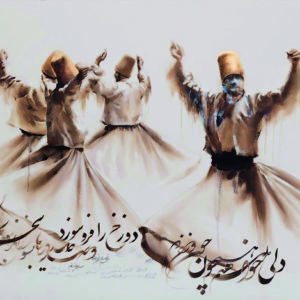 He has developed his own unique style of painting based on a combination of minimalism and the mystical philosophy of renowned Persian poet/philosopher Rumi (Molana). His work has been exhibited in the Middle East, Europe and United States.